It’s 6am and another day begins for Ben Tully at our Botley depot. 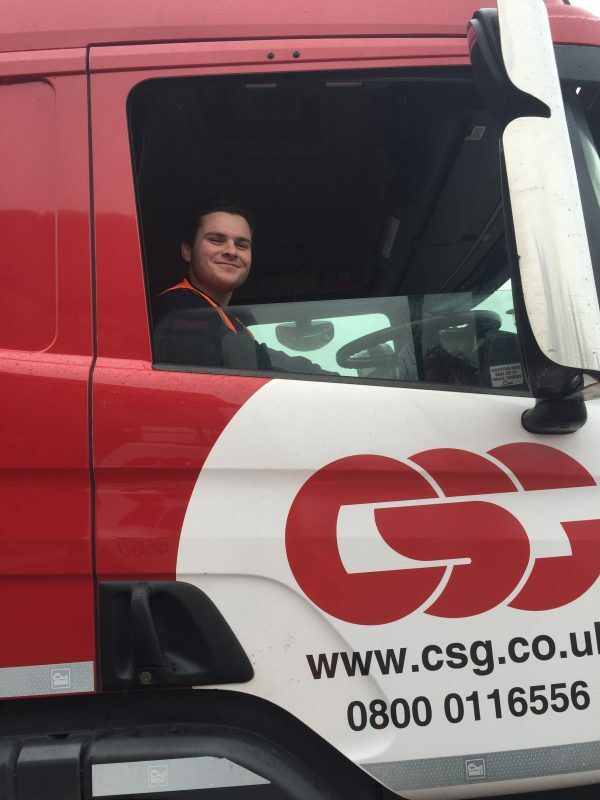 Ben is 21 and has just completed his apprenticeship and is ready to make the next move to become a tanker driver. Until he’s qualified to drive, he will remain a ‘second man’, assisting drivers in their daily rounds of collections from domestic and industrial customers across the Hampshire area, and beyond. Before he even gets in the lorry, there are checks to make to today’s vehicle. First, tyre pressure and wheel nuts, then oil and water checks, before lights and then the pipes and equipment involved with pumping the waste. Finally, a top-up of the diesel tank, if necessary and it’s time to get started on today’s list of jobs. On most days, it’s 6:15 as they leave the yard. CSG’s innovative PDA-based system arranges the jobs for all our tanker teams and so they consult the electronic device to see where they will be headed first. Like a SatNav, the system will expect the journey to take a certain amount of time and their ETA will be the similar to the time given to the customer to expect them. As long as there are no significant traffic delays, it all works perfectly. Once they arrive at each job, Ben and his driver will work together to prepare the site for the collection, using cones to cordon off the area, where necessary. Pipes are laid out and manhole covers are lifted and fitted with our unique safety barriers while the collection takes place. Lunch can be taken anywhere but the timing is dictated by the lorry’s tacograph, which must show that a 45-minute break has been taken after six hours. Like most drivers, Ben takes his lunch with him, together with a flask of tea and a bottle of water. It can make for an unusually close working relationship, spending hours together in the confines of a lorry cab, driving from one job to the next. As with any working environment, some people may be easier to work with than others but such proximity often means that drivers and their assistants will very quickly get to know each other quite well – a closeness that can be quite helpful when the two are dependent upon one another once they arrive at the next site. The job can be quite physically demanding and being able to do the job in all conditions is essential. Ben takes it all in his stride. Most days, Ben and his driver are back at the depot at around 4:45 but if the schedule and traffic dictate otherwise, it may be later than that. Again, the ‘taco’ has to be obeyed so timings have to be quite precise. The next move for this former apprentice is to progress to driving a tanker himself. That means passing an HGV test and also attaining a CPC (Certificate of Professional Competence) qualification for drivers. Having gained both, he will then initially drive on his own and can eventually expect to have his own apprentice. And so the cycle will start again. CSG are a firm supporter of apprenticeships and have found the scheme beneficial to the development of many individuals in roles across the company. Our Managing Director Neil Richards is firm advocate and has in the past stated that investing in programmes that develop skills is a great way to counter perceptions that the waste industry is too reliant on low-skilled labour. Ben is training for his HGV and CPC and will be taught by our own in-house training team for both. We wish Ben the best of luck in his forthcoming test and we’re sure it won’t be long before he’s working with his own apprentice.